Even with so many cosmetic treatments available today, there are few that can make teeth look as brilliant and attractive as porcelain veneers. Patients trying to hide stains that teeth whitening can’t remove, while simultaneously hiding chips and cracks, can find many benefits from this treatment. With that being said, many patients question their ability to stay white, even for years at a time. To learn if you’ll need to make changes in your daily habits to make veneers work, read this post from your cosmetic dentist in North Raleigh. Patients should be aware that before veneers are placed, they’re also given a thin layer of stain-resistant resin on top. This is meant to act as additional protection to foods and beverages you consume throughout the day. It’s also designed to protect the porcelain from scratches and other damage that can occur, especially from particularly hard or acidic foods. Furthermore, natural tooth enamel is porous, which basically means it contains hundreds of microscopic crevices for liquid to seep into. For this reason, enamel is very prone to staining and requires frequent maintenance to keep white. Porcelain is smooth and not nearly as porous as tooth enamel, therefore making it far less prone to staining in comparison. If the resin coating on top of veneers wears off and the porcelain becomes damaged in some way, it can get stained. Just like the porous surface that makes up enamel, porcelain can sustain damage if teeth are used irresponsibly or frequently exposed to harsh foods and beverages. They can also begin staining as a result of aging, which is to be expected. Porcelain veneers are not meant to last forever anyway, only holding a life span of 15 to 20 years on average. Keep in mind that time-frame is for people who take proper care of their veneers and don’t practice habits they wouldn’t do with natural teeth. Will Veneers Respond To Whitening? Patients hoping to remove stains through teeth whitening will be disappointed. Since they are made from a solid piece of porcelain, there’s no dentin layer for the whitening agents to treat. This is where the intrinsic stains in tooth enamel come from. Any stains that appear on porcelain resulted from damage to the veneers themselves. Therefore, the only way to truly remove discoloration is to replace the veneer entirely. However, some dental insurance plans may cover veneer replacement if they’re needed to restore and protect your existing tooth enamel, which is more vulnerable due to the minimal buffing needed to place veneers in the first place. 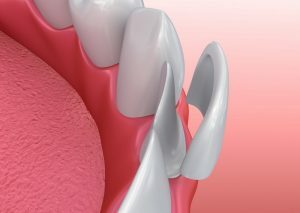 Want to learn more about the process of receiving veneers? Schedule an appointment with your dentist in North Raleigh today! Dr. Philip A. Lisk earned his DDS degree from the University of North Carolina School of Dentistry. To receive highly advanced ceramic materials placed by a cosmetic expert, look no further than his practice to design your brand-new smile! To learn more about his practice, contact him through his website.